Rice Uduk - This dish must have felt familiar in your ears, it's because so popular in almost all regions are uduk rice. However there were seized our attention that is typical betawi delicious and savory all. Various other preparations such as rice that had to be cooked, but there are some extra herbs and spices that so much more special. Maybe making a little bit tricky and requires concentration so uduk betawi rice that produced it fit as you wish. To cook rice cooker can also use approximately equal as fried rice is tasty too. Immediately, smokers do not need a convoluted again perhaps you too have been very curious about all how making simple but delicious exorbitant. Make sauces by mixing all ingredients peanut sauce, then puree, then give water little by little until it feels quite viscosity. Parboiled rice cook approximately 25 minutes, move to the pot. Boil the coconut milk mixed together with other required ingredients, until boiling. Then pour the rice to last until approximately one knuckle on the rice. Cook over low heat until milk is absorbed depleted. After that dikukusan Steamed rice until cooked. Lift. 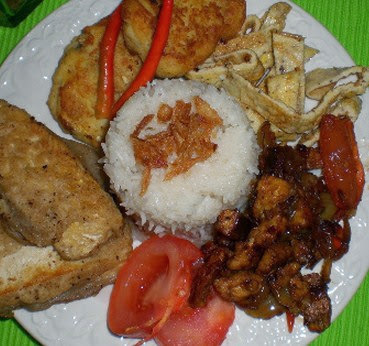 Serve rice recipe uduk betawi complete this by adding complementary ingredients such as fried chicken, fried tempeh, sliced tomato, potato cakes, boiled eggs, fried onions and a few other appendages. Immediately praktekin yes I also had laper ya when talking about this food continues to be so for now.